As I have mentioned in prior posts, as have most writers commenting on the current state of the financial markets, Europe has been the 500 pound gorilla controlling weekly, if not daily market gyrations. With the announcement of a trillion or so Euro bailout, the markets were free to rally on a solid estimated domestic GDP growth rate of 2.5% for the third quarter. The unexpected part is the latter, despite what has been weak, (if not awful) economic data, GDP certainly indicates that we have sidestepped a double dip recession, as long as the European solution is in fact a solution, and not just a solid kick, kicking the can further down the road. So let’s take a look at the charts and see where we are. First a look at SPY shows that we have not only broken out of the trading range established in August, but have also broken through the very key 200 day simple moving average (SMA). With the year’s previous high just 6% away look for a new 2011 high in the very near future, if the market’s reaction to the Euro deal remains positive. Anew trading range between the current level and prior high around 136 would be a healthy pause leading to a Santa Claus rally to finish the year. At the same time keep an eye on the former resistance line around 123. Any drop below, would likely come from the Euro agreement falling apart. 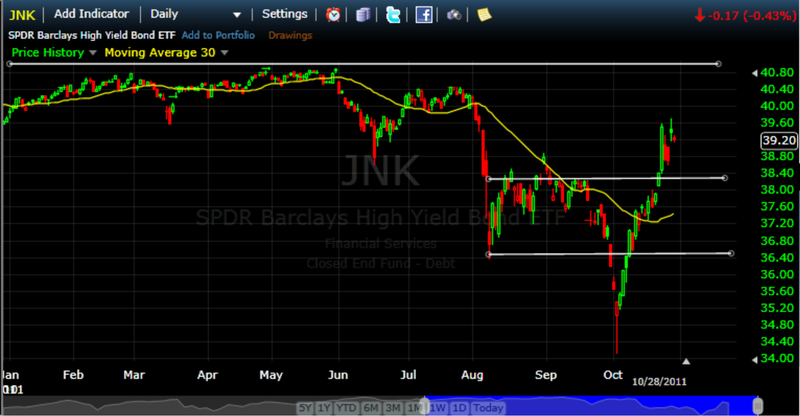 Next a quick look at JNK shows a similar pattern. A slight negative is that JNK actually turned negative on Friday the 28th, while SPY was able to follow through on through on Thursday’s news. This could have more to do with the drop in Treasuries as much to the positive GDP release then any lack of follow through to the Europe news. While a move to new highs for SPY would not be a surprise, JNK will likely be pressured by the potential for inflation/rising rates brought on by the bailout. JNK looks way over bought relative to its 30 SMA (Yellow Line) and a current yield of 8.55% (yahoo.com/finance as of Sept 30, 2011) seems fair to low depending on any further rise in Treasury rates. 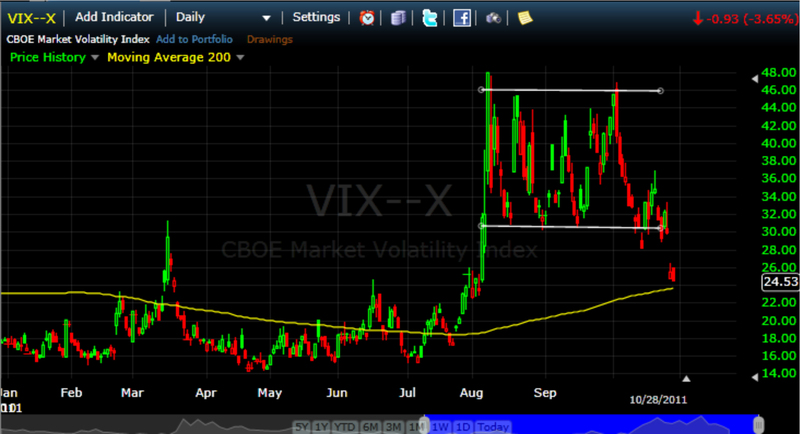 In Chart 3 you can see that the VIX also gapped down to coincide with Thursday’s big up day. While way down from its recent trading range, it is still at the top of the range established in the first half of the year when we saw a solidly rising market. Next a quick rundown of fundamentals. 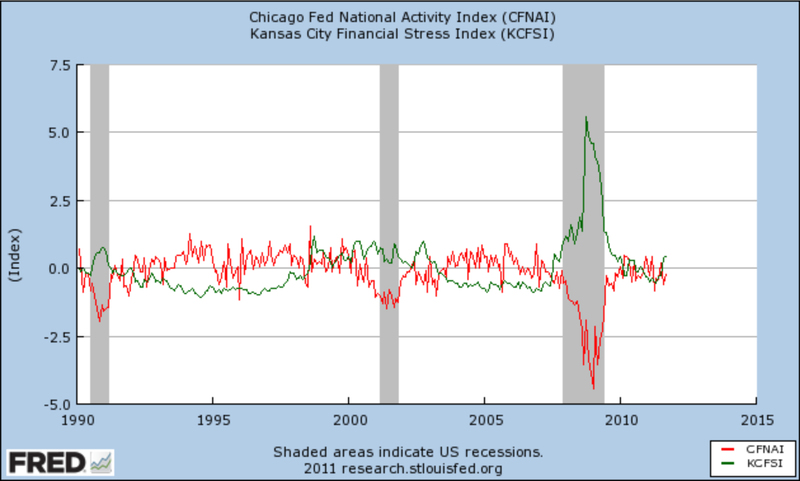 In Chart 4 you can see a history of the Kansas City Financial Stress Index (KSFSI) and the Chicago Fed National Activity Index (CFNAI). While both are in “bad” territory (Positive financial stress and negative activity index) they are not quite at the levels that have predated the last two recessions. However, when we zoom in, in Chart 5 you can see that the two indicators are heading in different directions in terms of indicating an improving economy. 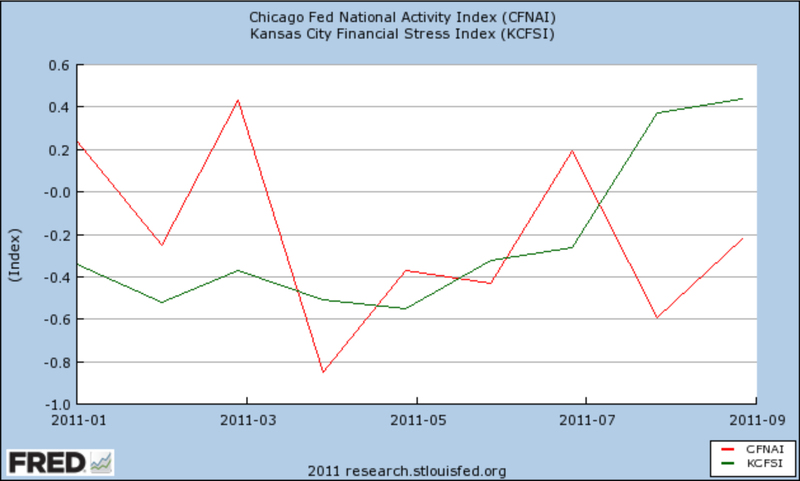 While the Chicago Activity index rose over the last month, so did the financial stress index. The theory behind the two indexes is that economic activity will be pulled lower if financials stress continues to increase. On this note, I have to throw in one slightly troubling chart. While earlier I noted that the absolute drop in JNK could be the result of rising level of interest rates. However, in Chart 6, we see that the bond market was not as enthralled with the Europe Solution as the stock market. The TED spread is the difference between the interest rates on interbank loans and on short-term U.S. government debt (“T-bills”). 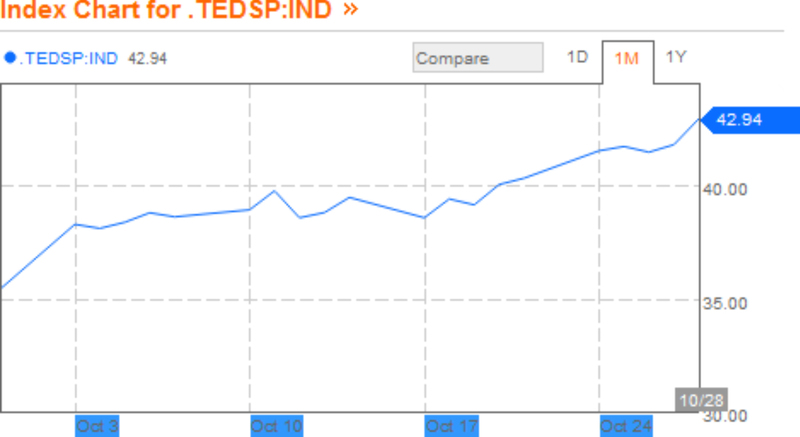 In Chart 7 you can see that the spread continued to rise through the market rally of the last week. The implication is that banks are even less reluctant to lend to each other now, then they were a week ago. This is not a good omen for future releases of the KSFSI. 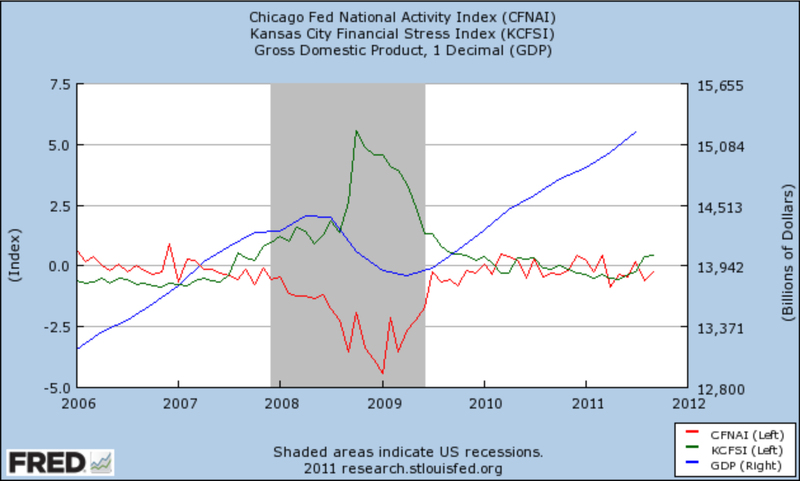 But not to end on a sour note, I’ll finish with the prior graph of the CFNAI and KSFSI, but this time throwing in GDP in Chart 8. This is the source of my renewed optimism. GDP is at the highest level it has ever been. 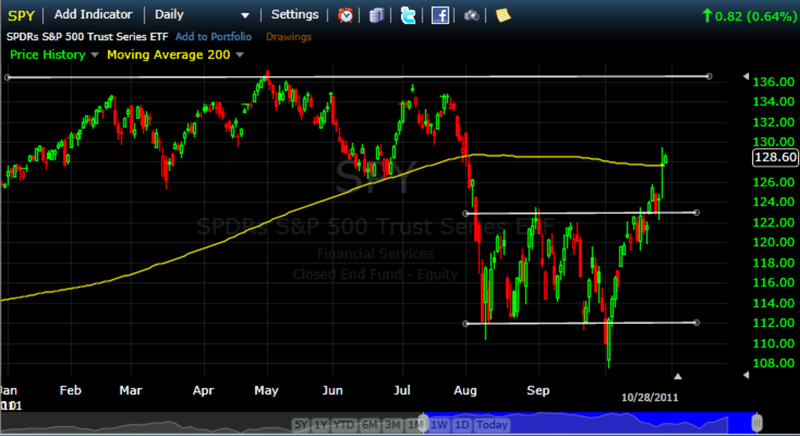 And yet, as we see in the final Chart 9, SPY is still well below prior peaks in both 2000 and 2007. In fact we are at levels first seen in 1999. Not surprisingly the Europe Solution is being scrutinized and the analysis is not as positive as the initial reaction. There are certainly some big holes. Seriously, who is going to step forward and “voluntarily” accept a 50% haircut on Greek bonds? And while there is to be a trillion Euros available to recapitalize European banks, where exactly will it come from, and at what price? At this point the stock market is only a couple percent positive on the year and trading at a modest 13 times earnings. Not where you’d expect a “euphoric” market to be. With the important 200 SMA breached to the upside for SPY, our modified trading signal will have us wait a few days to see if it holds. If so I will move our ETF Growth Cycle Portfolio into higher beta ETF’s to take advantage of the seasonality cycle that favors the November to May period. Our dividend portfolios have been fully invested since around the time JNK crossed above its 30 day moving average. For new accounts in cash, I will be scouring our targeted dividend stocks for stocks that have not fully recovered from last quarter’s sell off. Even if ( and it is a big if), Europe is out of the way for now, a muddle through economy still looks probable. I like the idea of generating return through dividend yields.